In honor of Earth Day coming up on April 22nd, Go Organically Fruit Snacks wants to share some creative ideas to switch up snack time. You know what they say: "One man's trash is another man's treasure." This rings even truer as we approach Earth Day and think of ways to teach our kids about keeping items out of landfills. For us, it's the perfect excuse to get creative and give new life to everyday objects by turning them into upcycled crafts. Check out the step-by-step instructions for making this awesome DIY dreamcatcher, then read on for additional super-simple craft ideas using household items like paper tubes, coffee cans and plastic water bottles. What better way to celebrate Mother Earth? Originating in Native American culture, dreamcatchers are believed to offer protection to little ones by "catching" bad dreams in mid-air while they sleep. With a web-covered hoop to snare nightmares, dreamcatchers traditionally feature natural decorative accents like feathers and wooden beads. Try your hand at making your own upcycled dreamcatcher with our easy tutorial! Dig through your closets to find an interesting old T-shirt, shawl, scarf or table runner that you no longer use. Look for an eye-catching graphic or interesting material that's lacy or crocheted. Cut your fabric so that it's slightly wider than the embroidery hoop, and at least twice as tall. Place the outer hoop on top and press down into place, adjusting the fabric and pulling it tight. Once you're happy with the fabric placement, tighten the top screw. Wrapping Paper Cuffs: Prevent rolls of wrapping paper from unraveling with paper tube "cuffs." Simply slit tubes lengthwise with a pair of scissors and slip over either end of your wrapping paper roll to keep it contained. Bowling Pins: Fill 10 plastic water bottles with two inches of water or a bit of sand at the bottom, then put the caps back on. Arrange your "pins" on the floor and let kids roll a ball to knock 'em down. Penguin Pal: Fill an empty clear water bottle with cotton balls, then use foam sheets or sturdy construction paper to add the wings, head and feet. Don't forget the googly eyes! Happy Earth Day from Go Organically Organic Fruit Snacks. Made with real fruit, the gluten-free, nut-free, dairy-free kids snacks are a great choice for your on-the-go life. Be sure to follow Go Organically on Facebook for more kid-friendly ideas. 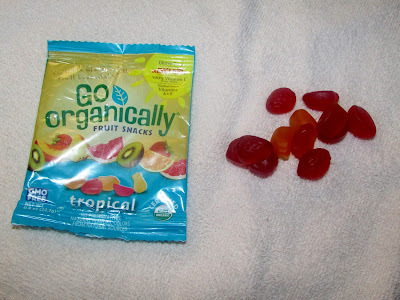 One person will win three boxes of Go Organically Organic Fruit Snacks (one box of each flavor). I don't do anything any more since I have retired. We do not really celebrate earth day, but maybe we should! We don't really do much, but my son usually does activities in school. We think every day is Earth Day since we reduce, reuse, and recycle every day. When the children are a bit older, we will do some special Earth Day activities with them. Our town throws a huge earth day event- full of environmental friendly information, products and fun! We all plant trees and flowers together and it is always a blast! We don't really do anything special for Earth Day. I planted some more flowers in my yard. I don't do anything for Earth day; I don't even know when it really is to be honest. Everyday is Earth Day! We garden, raise chickens, eat an organic diet and are aware of our carbon footprint. I work all day so I don't have a chance to do anything for Earth day. I don't do anything special for Earth day. I do things everyday like recycle and bring my own bags to the stores. I do not do any special things for that day. We are using less paper products now though. We have a big gathering at a park nearby and have lots of stuff to do for all ages. Always fun and crowded. Nothing special! We always recycle! We really don't celebrate Earth Day but we love recycling. We have in the past attended a clean up at our local park on Earth Day. I did not do anything special. I work at a school and they had tee shirts made for Earth Day and they have different events planned. Everyday, but especially on Earth Day, I try to be conscious of the waste I put into the world, so I can work to limit it. I pick up trash and recycling that others leave on the ground, compost all my organic materials, and have a home garden. No, I don’t do anything for earth day, however I enjoy gardening and I recycle. I homeschool my kids, so we always spend the day doing Earth Day crafts and learning about living green. When we can, I take them somewhere to help plant a tree. I like to get together with my sons and BBQ ! We do not do anything special for Earth Day, however I do recycle all year long. I have a compost pile and I take care of my trees and shrubs. We recycle year round, but often on Earth Day, we plant a flower or tree! I haven't done anything on Earth day. I don't do anything for Earth Day. No I don't do anything since I am sick. We try and clean up our yard for spring. We went to our town's Earth Day festival. We take a long walk and pick up trash! I dont celebrate earth day persay, but I do recycle bags, bottles and use my own totes for groceries. We had a celebration at a park here. My husband did a stone carving demo, the kids climbed a huge tree, and we walked around to learn things our city has to offer to help the earth. we dont do anything on Earth day but try and do things for the earth year round such as recycling and planting trees. On Earth Day I usually start preparing my gardens for planting. I like to plant both vegetables and flowers. I wrote a dedicated post for Earth Day to spread the word. We recycle and reuse everything we can, but we don't do anything special for Earth day. I'm usually out enjoying the state or national parks. We join in the local city clean up for Earth Day. We do in a way because it is my niece's birthday and she has usually had us outdoors. I am vegan which is like making every day earth day. i don't do anything special on earth day. No I don't do anything! We don't celebrate Earth Day, only the Creator. I don't really do anything for Earth Day but if I wasn't renting I would probably do some planting. No, we do not do anything to celebrate Earth Day. I have never celebrated Earth day. It is another day to work in the garden! I don't usually do anything on Earth Day. Help clean up the beaches. We grow our own veggies. For Earth Day it's self, we don't do anything. For Earth Day- i try to pick up some trash and plant a tree when I can. We never did anything until this year, my children and I walked around picking up litter and made a plan to plant a tree next year! Sorry. There only so days in a month. I consider every day as Earth Day so I do not do anything different on just that one day than I would do every other day. something for the environment everyday. I don't do anything special on Earth Day. You don't hear anything about it here. I am earh conscious throughout the year by recycling and being energy wise. I have not done anything special for Earth Day but love the project ideas. I go for a nature walk to celebrate Earth day. We have great outdoor events in our city on earth day. While we normally do environmental clean-ups throughout the year, I specifically take my kids to Earth Day clean-up events. I just conserve energy for 1 hour on Earth Day. We don't celebrate, but it might be good for our kids if we do.